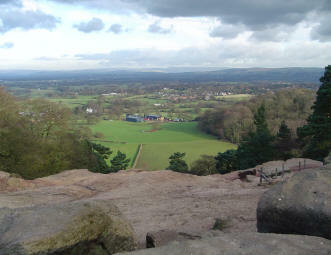 Alderley Edge is described in geology and history on other pages on this site. however, there are many other aspects to the Edge and this section covers just a few. These include the story of the Wizard which gives the Wizard Restaurant, Tea Room and well their names; the books of Alan Garner based around Alderley, especially the Weirdstone of Brisingamen; the story of the Stanleys (yet to be added), local sites and villages around Alderley Edge and Chorley; and the Surgery. Alderley Edge is listed in the Doomsday Book as Aldredelie. The name is believed to derive from 'woodland clearing of a woman called Althryth' plus 'Edge' added in the 19th century (Oxford Dictionary of British Place Names, 1991). Alderley Edge, as it is popularly known, actually covers part of three parishes: currently Wilmslow, Nether Alderley and Over Alderley, which all meet on Glaze Hill. Alderley Edge has been inhabited through the neolithic, Bronze and Iron Ages and was certainly visited by the Romans who mined at Engine Vein. It was acquired by the Stanleys in 1602 and sold by them in 1938. A large part of the estate covering the Edge itself and the hinterland were kept out of the sale by the Misses Pilkington and transferred to the National Trust in 1948. The Edge is now a very popular walking, dog exercising, sight seeing and ice-cream eating venue as well as keeping a whole bunch of cavers amused at weekends and during the evening. This is all in keeping with the history for many decades as even during the period of Stanley ownership, the Edge permitted to be used for public access at certain times of the year. The town of Alderley Edge is more properly known as Chorley having changed its name in the 19th century partly to reduce confusion with Chorley in Lancashire and partly to improve its image.